But even then, you’ve got 30 albums across a load of projects. That’s hardly an entry point. 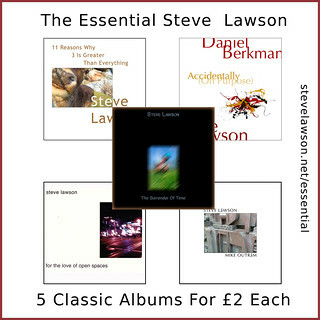 So, in order to act as a lower level intro, here’s a selection of five albums, available for now for just £2 each, that will act as an intro to my musical world. This feels like the culmination of pretty much everything I’ve done so far. It’s where I’d point anyone wanting a first listen to my musical world. Secondly, I’d suggest 11 Reasons Why Three Is Greater Than Everything – it was the last all-solo album I did before I added in the percussion and synth stuff, so the final statement of the first 15 years of my solo career. One of the most popular of the collaborations I’ve done is Invenzioni with Mike Outram – all guitar and bass duets, improvised live in the studio. For The Love Of Open Spaces was the 2nd collaborative project I ever recorded, and was the beginning of so many things. Working with Theo Travis was a truly enlightening and enthralling experience. The FingerPainting Project with Daniel Berkman is still the biggest musical undertaking of my life – months and months of mixing and mastering went into releasing the entirety of the first 10 shows we played together. Every note. Accidentally (On Purpose) was the 2nd show we ever played, and the first album released. So there you go – I could’ve included Live So Far with Lobelia, which is a document of the most enjoyable tour I’ve ever done with the greatest singer I’ve ever worked with, or Diversion with Jon Thorne which captures an extraordinarily special performance at the London Bass Guitar Show, but I honestly believe that are no weak links in my catalogue – if there were, they wouldn’t be out there. Everything here exists because I think it’s worthwhile, not because I think I can make a ton of money off it – I wouldn’t be playing solo bass if that was the case. It’s an ongoing exercise in taking the road less traveled and carving out a different kind of space for music to be made, discovered and enjoyed.